By exploiting the neatest trick of the week, they have converted a basically humdrum yarn of spies and an inventor’s precious formulas into a tidy and tingling little thriller. Their central character, the sleuth, is blind. And on that depends every ounce of the film’s suspense. Otherwise it is simply an ordinary story about a secret invention, the crowd of Nazi agents who staff the inventor’s household as servants and an incidental quarrel between his wife and her stepdaughter over a misunderstood romance…. But in creating the blind character the author has struck upon a devilish device for suspense because any audience is filled with an instinctive sense of his helplessness. A blind man walking through a darkened room into which a murderer may stalk at any moment is a highly suggestive situation, you may take our word. And when, about to be shot in the basement, the detective smashes the light and calls to his would-be killer: “Now you’re in my world — darkness!” it is hokum, certainly, but the audience is at the end of the chairs. For Monday, we have a mystery pooch. Update: Of course, our mystery for Monday was Friday. For Tuesday, we have a mysterious gent. Update: This is Mantan Moreland. Brain Trust roll call: Thom and Megan (mystery movie and Monday’s mystery pooch) and Sue Slutzky (Monday’s mystery pooch). For Wednesday, we have a mystery gent. He does not approve of such goings-on. Brain Trust roll call: Mary Mallory (Tuesday’s mystery gent), Sue Slutzky (mystery movie and Tuesday’s mystery gent), Howard Mandelbaum (mystery movie, Monday’s mystery pooch and Tuesday’s mystery gent), Don Danard (Tuesday’s mystery gent), Mike Hawks (Tuesday’s mystery gent), Chrisbo (Tuesday’s mystery gent), Jenny M. (mystery movie, Monday’s mystery pooch and Tuesday’s mystery gent), Sarah (mystery movie, Monday’s mystery pooch and Tuesday’s mystery gent), Earl Boebert (Tuesday’s mystery gent), Thom and Megan (Tuesday’s mystery gent), Sylviai E. (mystery movie, Monday’s mystery pooch and Tuesday’s mystery gent) and Bob Hansen (Tuesday’s mystery gent). For Thursday, we have a mystery couple. Update: This is Anne Harding and Reginald Denny. Brain Trust roll call: Mary Mallory (mystery movie, Monday’s mystery pooch and Wednesday’s mystery TV Western doctor), Don Danard (Wednesday’s mystery TV Western doctor), Sheila (Tuesday’s mystery gent), Gary — checking in from Mexico (Tuesday’s mystery gent), Dan Nather (Tuesday’s mystery gent), Mike Hawks (Wednesday’s mystery TV Western doctor), Sylvia Edwards (Wednesday’s mystery TV Western doctor), Sarah (Wednesday’s mystery TV Western doctor and Monday’s mystery pooch) and McDee (mystery movie, Monday’s mystery pooch, Tuesday’s mystery gent). Megan and Thom, and Sue Slutzky — they are in the movie, but in different roles. For Friday, we have a non-mystery woman and an unmysterious gent. With serious lapels. Update: This is Donna Reed and Edward Arnold. Brain Trust roll call: Mary Mallory (Thursday’s mystery guests), Sheila (mystery movie and Thursday’s mystery guests), Howard Mandelbaum (Wednesday’s mystery TV Western doctor and Thursday’s mystery guests), Michael Hawks (mystery movie and Thursday’s mystery guests), Sue Slutzky (Thursday’s mystery guests), Sylvia E. (Thursday’s mystery guests) and L.C. (mystery movie and mystery cast). This entry was posted in 1942, Animals, Film, Hollywood, Mystery Photo and tagged #MGM, 1942, Eyes in the Night, film, hollywood, mystery dog. Bookmark the permalink. Good guess, but alas, I’m afraid not. Strongheart had crossed Rainbow Bridge by the time this film was made. Well, let’s start with Rin Tin Tin. Another good guess. But alas, Rinty had crossed Rainbow Bridge by the time this film was made. Lightning in THE CASE OF THE HOWLING DOG (1934). Great guess. But alas, I’m afraid not. Friday is our mystery pooch, in Eyes in the Night, I believe. Rin Tin Tin Jr. in THE TEST (1935). Kapitan son of Rin Tin Tin ? Oh, good guess! But, alas, no. Smokey “yesterday” and Mantan MOreland “today” in SIGN OF THE WOLF. Where did my answer go from last night? Mantan Moreland and Smokey the dog from yesterday in SIGN OF THE WOLF? Today I’d say it’s Mantan Moreland. Eyes in the Night with Mantan Moreland and the dog Friday. Ace The Wonder Dog fooled me for a bit, But Deacon McDaniel puts them in Silent Witness. Alas, I’m afraid not. But an interesting guess! Tuesday’s Guest is Mantan Moreland I believe. I know! (Waves hand enthusiastically)! It’s Lassie dressed up for Halloween! Today it’s Mantan Moreland in 1942’s “Eyes of the Night”, with Friday (who is Monday’s dog!). 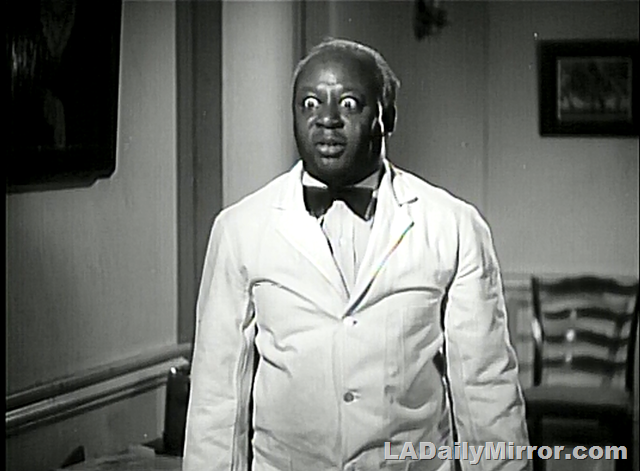 My Guess for Tuesday is Mantan Moreland, best set of hard-boiled eyes this side of Peter Lorre. Possibly one of the Charlie Chan movies, but I don’t recognize Monday’s dog, so I’ll see if tomorrow brings clarity. “Hasty conclusion like gunpowder — easy to explode.” C.Chan, Lt, HPD. This will be a fun one. Mantan Moreland on Tuesday! I don’t know the movie though. EYES IN THE NIGHT. Milburn Stone today and Friday the dog Monday. Milburn Stone today. His look of amazement comes from finding out he’s been cast in a tv western!! And he’s got a dog on his chest! I.m still in Mexico but I can.t resist the opportunity to say hello to <mantan <moreland.Hola todos. Well, Tuesday’s gent is Mantan Moreland, but that’s all I got so far . . . Ace the Wonder Dog–from Tim Holt’s “The Rookie Cop”? A good guess, but the wrong studio, alas. This is a fun cast. Willie Best and Elisha Cook Jr. in A-Haunting We Will Go? Today’s actor is Milburn Stone, being pinned by Friday. Monday’s dog is Friday. Tuesday is Mantan Moremand. I believe the film is Eyes in the Night from MGM 1942. We think Reginald Sheffield is Wednesday’s mystery man. Reginald Denny and Ann Harding today. Reginald Denny and Ann Harding. EYES IN THE NIGHT. Stephen McNally on Wednesday. Thursday: Reginald Denny and Ann Harding. Pretty sure Thursday’s Mystery Man is Miles Mander. Can’t place the Lady at the moment. This movie has such a fun cast. Eyes in the Night (1942) w/Friday (dog), Mantan Moreland, Ann Harding, Reginald Denny, Edward Arnold, Donna Reed, …. Donna Reed and Edward Arnold. Friday: Donna Reed + Edward Arnold = Eyes in the Night (1942). Looking forward to Saturday’s breakdown. A fun mystery ‘mystery’ movie. Fri. – Donna Reed and Edward Arnold. Edward Arnold and Donna Reed today.